Soil sampling is the first step in generating field-specific information on which to base lime and fertilizer decisions and in monitoring soil nutrient status over time. For general soil sampling information, see the SoilFacts publication Careful Soil Sampling: The Key to Reliable Soil Test Information (AG-439-30). Interpretations of soil tests are based on years of field calibration trials with crops grown on relatively small, uniform experimental plots. Since soils within large agricultural fields vary, composite soil test results cannot accurately represent all portions of a field. The composite field sample results mask scattered areas of both higher and lower levels of plant nutrients. If nutrient status is highly variable, then a substantial portion of the field area might respond to lime or fertilizer applications or both, even if a composite sample suggests no response. increase nitrogen use efficiency (which reduces leaching and runoff losses) by correcting other nutrient deficiencies. In contrast, the analysis of a composite soil sample from a field provides lime and fertilizer response data for average field conditions. Since fields are not uniform with respect to acidity and nutrient levels, each field consists of regions with differing lime and fertilizer needs. Base Map: Georeferenced boundary map used repeatedly for location referencing. Cell Sample: Sampling throughout a grid cell so that the sample represents the entire cell. Differential Correction: Correction of GPS signals to increase accuracy from approximately 100 yards to 1 yard. This is done with an additional signal from a dedicated transmission tower (Mobile-Data, SatLoc) or a commercial FM radio station (DCI, ACCQPOINT) both of which have ranges of 100 miles or less, or by a separate corporate satellite signal (Chance, SatLoc, Deere), which has a range of thousands of miles. Directed Sample: Sampling scheme based on field variability due to either inherent soil properties (soil texture, drainage, etc.) or land management history (drainage, land shaping, spreader patterns, previous land use, etc.). This reduces the number of samples while still recognizing zones of differing nutrient status. GIS: Geographic Information System. Computerized system to store, manipulate, and display geographically referenced information. GPS: Global Positioning System. References ground position based on satellite signals. There are 24 US Department of Defense satellites which beam directional signals. At least four are in view at any one time. Intentional errors introduced into the signals limit accuracy to approximately 100 yards without differential correction. Grid: A network of lines superimposed on a field map to assist in sample positioning. Lat/Lon: Latitude (0-90° north or south of the equator) and Longitude (0-180° east or west of Greenwich, England). Can be given in degrees, minutes, seconds; degrees + decimal places; or a standard planar projection. In North Carolina, 1 longitudinal degree = 60 miles, 1 longitudinal minute = 5,280 feet, and 1 longitudinal second = 88 feet. Note that in North Dakota, 1 longitudal second equals only 72 feet, since it is closer to the north pole where the longitudinal lines converge. 1 latitudinal degree = 70 miles, 1 latitudinal minute = 6,160 feet, and 1 latitudinal second = 103 feet. The center of the NC State University campus is located at 35°47'10.0" N, 78°40'18.0" W.
Point Sample: Highly localized sampling around grid line intersections or around a point within a grid cell, so that the sample represents the point. 1. Construct a base map of the field that includes georeferenced boundaries. To construct a base map that delineates the field boundaries in a digitized format, buy the portable differential correction GPS navigation units that identify horizontal position to within 10 feet or less. Map any recognizable field subunit boundaries if they are to be used in the design of soil sampling schemes. Relevant field subunits could include soil survey map units, or areas with distinct management history, consistently different crop yields, etc. (Figure 1). 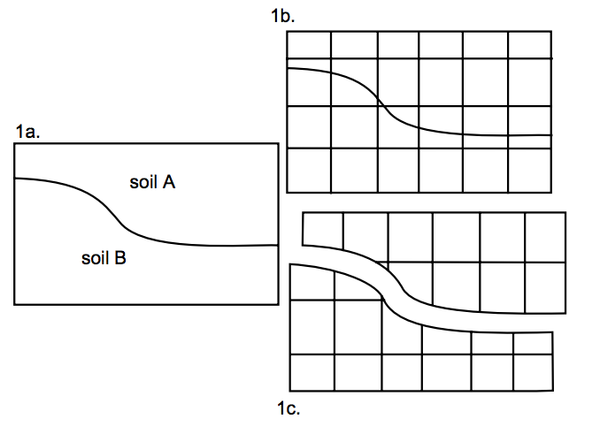 Notice that Figure 1b reveals that a single grid system defines grid cells composed of only soil A, only soil B, and a mixture of soils A and B. This scheme may adequately reflect the nature of the transition zone between soil types. Or each subunit could be sampled with a separate grid system preventing any overlap if desired, as shown in Figure 1c. 2. Select the best sampling strategy: cell, point, or directed sampling. The most straight-forward sampling scheme is the “cell.” A cell is a subunit of a whole field. Soil cores collected from locations throughout a cell are mixed to generate a composite sample for the cell. The resulting lime and fertilizer rates will be applicable to this entire cell. 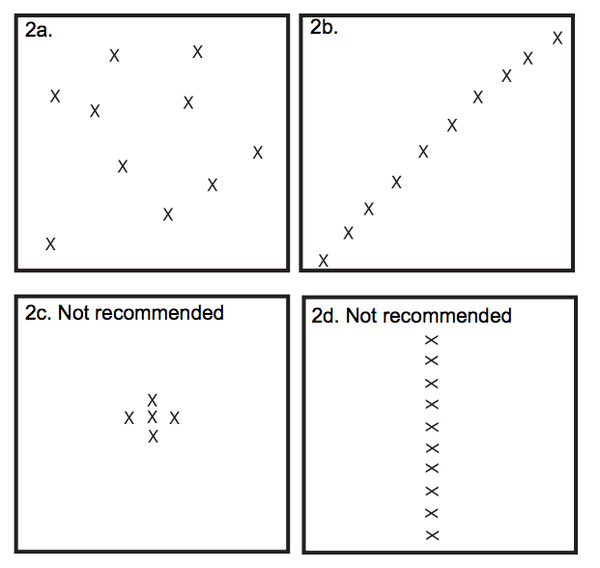 The entire field might then be represented by a checkerboard pattern of different recommendation rates. Currently, a grid size of 2 to 21⁄2 acres is commonly used for grain fields by North Carolina firms offering precision soil sampling services. This cell size is a practical decision, there are no mathematical criteria governing minimum cell size. Smaller cell sizes might be justifiable if a higher value horticultural crop is to be produced. In a 21⁄2-acre cell, 5 to 10 cores should be collected from random locations within each cell (Figure 2a). Or they may be taken from a pattern which facilitates vehicular access to the sampling points, as shown in Figure 2b. To avoid sampling position bias, do not concentrate sampling in the vicinity of a central point or sample within a straight line (Figure 2c and Figure 2d). Samples taken within a straight line might unintentionally correspond to spreader patterns of previous lime or fertilizer applications, or both. Point sampling is better for detecting patterns of field variability because all core samples are collected near georeferenced points (located at grid line intersections), rather than scattered throughout the cell. Soil test parameters are calculated between sampling points, which permits the construction of contour maps of each soil test parameter (Figure 3). A disadvantage of the point sampling scheme is the close sample point spacing required for the mathematics to be reliable. Experience in the midwestern US and from North Carolina suggests that points should be spaced 100 to 200 feet apart. At a spacing of 209 feet, one sample would be required for each acre of land, and at a spacing of 104 feet, four samples would be required for each acre of land. This is much more intensive, and thus much more costly, than the more commonly used 2- to 21⁄2-acre cell sampling scheme for grain crops. Directed sampling uses an understanding of field variability to reduce the number of samples while still recognizing zones of differing nutrient status. Crop growth and yields vary due to a number of factors. Some of these are inherent soil properties (soil texture, drainage, etc. ), and some are due to land management history (drainage, land shaping, spreader patterns, previous land use, etc.). If a consistent soil factor controls yield variability in a field, then the distribution of this factor, or the distribution of crop yield, can assist in the design of a soil sampling scheme (Figure 4). On a cautionary note, if the selected factor is not a consistent predictor of yield, this scheme unnecessarily biases the sampling process and is less efficient than either cell or point sampling schemes. There are no definitive criteria dictating which soil sampling scheme must be used. Table 1 describes some of the advantages and disadvantages of each of the three sampling schemes. Table 1. Precision farming soil sampling schemes. 3. Generate sampling grid with appropriate shape, size, and orientation. Computer software packages can position sampling grids on top of the field base map. A special consideration of the long (2500-plus feet), narrow (150–300 feet) fields in the North Carolina Tidewater region is that rectangular grids are more appropriate than square grids (Figure 5). This is due to the management induced variability along the narrow axis when digging surface ditches and crowning fields. Thus, variation occurs over a shorter distance along the narrow axis than along the long field axis. For point samples on these Tidewater fields, spacings of 100 feet are required in the narrow dimension, while spacings of 700 feet along the long axis are sufficient. In all fields, grid sizes and compass direction orientations can be manipulated to more closely align grids with field borders. 4. Collect soil samples using appropriate procedures. As with all soil sampling, attention to sample depth and collection of sufficient cores are critical. The North Carolina Department of Agriculture & Consumer Services recommends that samples from cultivated fields be collected to the depth of the plow layer, generally 6 or 8 inches. For established no-till fields and sod, samples should be collected to a depth of 4 inches. Traditional composite soil samples of 20 acres or less should consist of 15 to 20 cores, or approximately 1 core per acre. With a precision soil sampling scheme based on 21⁄2-acre grids, 5 to 10 cores should be collected, or approximately 1 core per 1⁄4 to 1⁄2 acre. Avoid fertilizer bands and areas disturbed by vehicular traffic. Thoroughly mix the core samples in a clean plastic bucket and then transfer the sample to a soil box. Figure 1. Base map showing (a) whole-field and subunits, (b) single overlaid sampling grid, and (c) separate overlaid sampling grids for each soil type. Figure 2. Base cell sampling patterns on (a) random core samples or (b) systematically arranged core samples to facilitate sampling vehicle access. Avoid (c) highly concentrated core samples and (d) core samples parallel with crop rows. Figure 3. 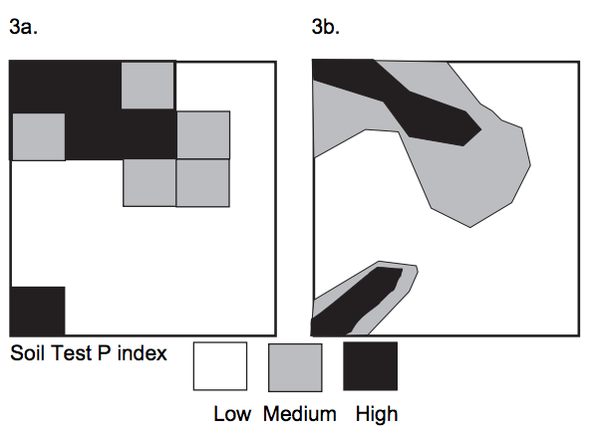 Soil P index maps (a) based on a cell sampling scheme and (b) based on a point sampling scheme. Figure 4. Directed soil sampling schemes (a) based on previous land use and (b) based on prior crop yields. Figure 5. Sampling grid shapes for (a) common fields and (b) long, narrow Tidewater fields with surface drainage ditches. An informal survey of providers of precision soil sampling services in Eastern North Carolina revealed a cost range of $8.00 to $9.50 per acre for sample collection on a 2- to 2 ½- acre grid cell size. One provider offered 1-acre grid cell sampling for $19.50 per acre for vegetable producers. The cost for traditional, composite soil sampling varies with field size, but general estimates are $1.00 to $2.00 per acre. Cost estimates for variable rate applications of lime and fertilizer are difficult to standardize as they can be given in terms of $/ton or $/acre spread. Acres spread are less than total field acres if not all of the land receives lime or fertilizer. General estimates of the additional cost for variable rate application above those for conventional application in North Carolina are approximately $2.00 to $3.00 per ton for lime, and $3.00 to $5.00 per ton or $1.50 to $2.75 per acre spread for fertilizer. Several potential benefits of precision soil sampling and variable rate applications exist. Variable application rate technology should minimize nutrient deficiencies and reduce costs by eliminating or reducing application rates at sites with sufficient lime or fertilizer, or both. The correction of localized nutrient deficiencies should lead to an increase in nitrogen use efficiency, since other nutrients will not be limiting. If these benefits can be met, then more efficient nutrient utilization should reduce runoff and leaching risks. A key factor in realizing the potential benefits of precision soil sampling lies in improving our understanding of yield-limiting factors within fields. Yields can vary within fields for many reasons: weeds, insects, microclimate, soil nutrient status, and other soil properties (texture, topography, wetness, etc.). The greater the role of soil nutrient status in determining yield predictability, the greater the potential of precision soil sampling. Precision soil sampling is one of an array of precision farming tools available to use nutrients more efficiently in agriculture.